For my ongoing project on the history of emotions in the novel, I thought I’d post a first pass of emotion networks that appear in the Romantic Novel versus the Postwar Novel. The networks are based on emotion words that occur in the same sentence. The more often emotions appear in the same sentence the stronger their connections, the closer they will appear. The size of the word is an indication of the number of different emotion words that each word connects with. The initial finding of interest here is the way the postwar network is both less dense and also more heterogeneous (what network scientists would call a decline of assortativity). The emotional intensity of the novel has declined, but the emotional complexity has arguably increased. Emotion words are not grouping quite as strongly with words in their own emotions. The hypothesis would be that there is more emotional conflict happening at the sentence level of the novel as it appears in the second half of the twentieth century. These networks represent small sets of around 40 novels each. I am taking a second pass on larger data sets and am curious if the results hold. I will also be calculating the actual measures of things like density and assortativity to better understand the extent of this shift. The next step will be going in and finding out what it means when different kinds of emotion words appear in sentences together. What is being captured here? I thought these graphs give a nice initial idea of the ways in which the emotional networks of the novel have changed over the course of two centuries. 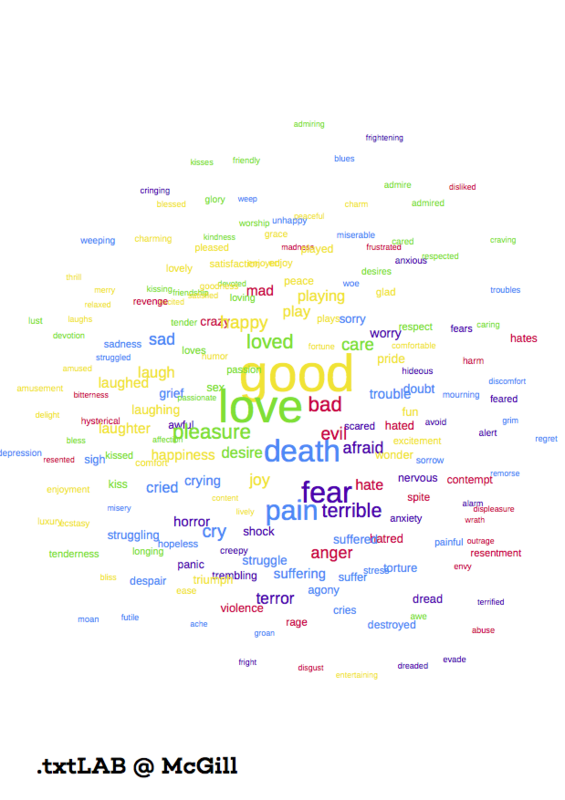 Network of emotions in 40 novels written in English between 1800 and 1851, from Maria Edgeworth’s Castle Rackrent to Nathaniel Hawthorne’s House of the Seven Gables. Yellow = Joy, Green = Love, Blue = Sadness, Purple = Fear, and Red = Anger. The underlying edges between emotion words have been removed for clarity. Emotions are based on a dictionary of 872 emotion words. 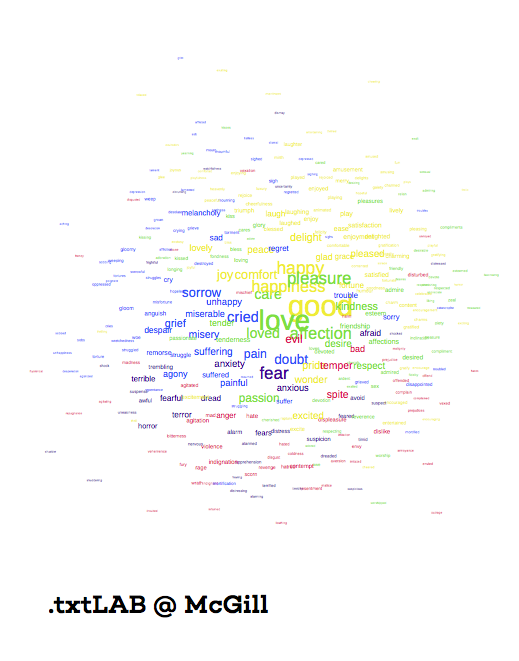 Network of emotions in 42 novels written in English between 1943 and 2000, from Betty Smith’s A Tree Grows in Brooklyn to Zadie Smith’s White Teeth. Yellow = Joy, Green = Love, Blue = Sadness, Purple = Fear, and Red = Anger. The underlying edges between emotion words have been removed for clarity. Emotions are based on a dictionary of 872 emotion words.